La Cocina en el Bolsillo is a series of pocket-sized cookbooks published at the turn of the 20th century in Mexico City by Antonio Venegas Arroyo. The multi-volume series is lined with a number of traditional recipes for everything from mole sauces to albondigas fingidas (fake meatballs). 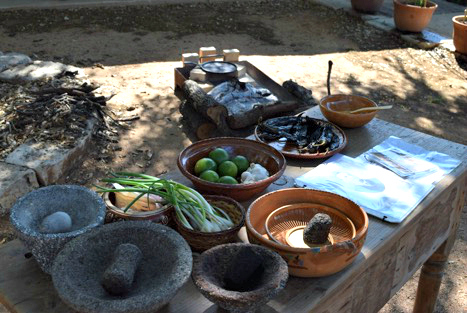 The cookbooks were sold across Mexico and the U.S.—including San Antonio, where Pablo Cruz, publisher of El Regidor newspaper, sold them for 10 centavos each at his Laredo Street storefront near Casa Navarro State Historic Site. Consisting mostly of the pasilla peppers, garlic, onion, lime with salt, pepper, and cinnamon, Salsa de Chile Pasilla y Vinagre (Pasilla Pepper and Vinegar Sauce) has a smoky flavor due to the peppers. The tart flavor of the limes offsets the peppers making this salsa ideal for enhancing anything from chicken and rice to tortilla chips. 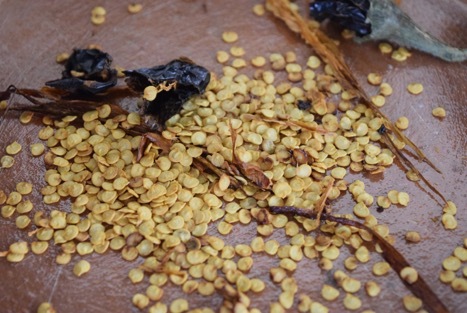 Pasilla peppers are the dried form of the Chilaca pepper, a variety commonly cultivated throughout central Mexico. They typically measure between six and nine inches in length and change from green to a dark brown color when ripe. Chilaca peppers are available for purchase in Mexican markets throughout the spring and summer, while their dried form is available year round. Most vinegar used in Mexico was fermented from fruit. Common vinegars included those distilled from apples and pineapples. We chose to use limes as a substitute for vinegar in this recipe in order to add acidity to the salsa. Limes were commonly grown throughout Mexico, having been imported by the Spanish. However, they were not cultivated in Texas until the 1800s. Remove the seeds and veins off some black peppers. Roast the peppers, and grind them with some garlic cloves, thin out the mixture with vinegar, and season with salt. 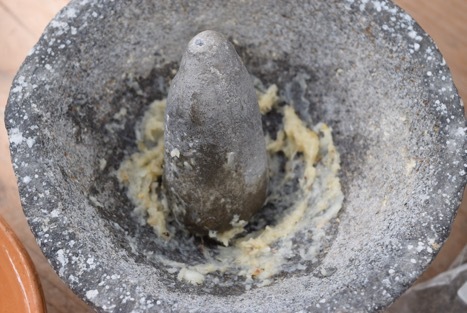 Grind four peppercorns, and a little bit of cinnamon, and after everything is well mixed, chop some onion into small pieces, mix everything with oil, and serve. Our modern interpretation of this recipe calls for four dried pasilla peppers, five cloves of garlic, one to two limes, one-half large onion, salt, peppercorn, and cinnamon to taste. 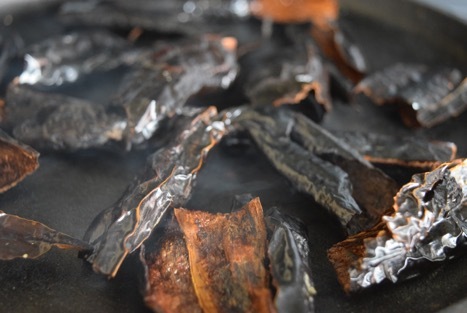 Begin by roasting the dried pasilla peppers on a comal until they become aromatic, turning when necessary. 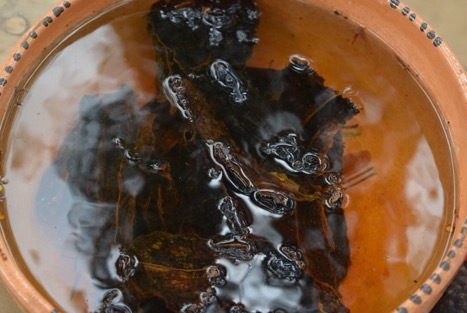 Afterward, break open the peppers, remove the seeds and veins, place them in warm water for 10 minutes or until they are soft, and set this water aside for use later. 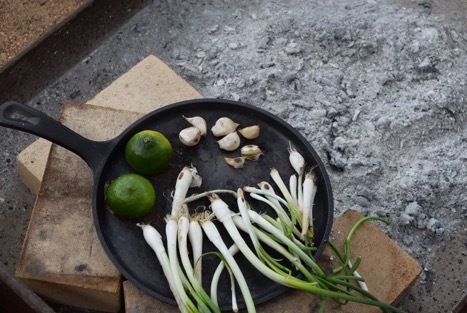 Roast the halved lime, garlic cloves, and onion on a comal until all are browned. 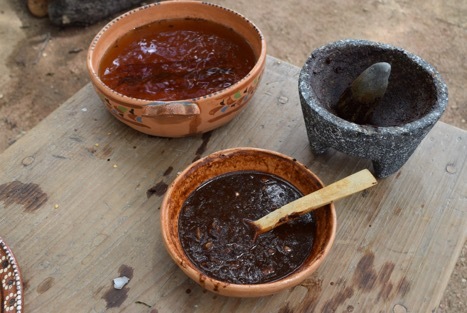 Grind the garlic cloves in a molcajete with the soaked pasilla peppers and peppercorn until you produce a thick paste—it may be easier to grind each pepper separately depending on the size of the molcajete. Thin out the paste using the water the peppers were soaked in. Mix the paste, water, and lime juice together until a desired thickness is achieved. The second lime can be added in order to produce a more savory salsa. Add the chopped and roasted onion on top and serve. Antonio Vanegas Arroyo Ed. La Cocina en el Bolisillo. 1890s and 1913. Dunmire, William W. Gardens of New Spain: Gardens of New Spain: How Mediterranean Plants and Foods Changed America. Austin: University of Texas Press, 2014. “La Cocina en el Bolsillo: A Turn-of-the-Century Pocket Cookbook Series,” La Cocina Historica Blog, June 9, 2014. “Pablo Cruz: A Laredito Bookseller,” La Cocina Historica Blog, January 26, 2015.